Their names are familiar and unavoidable to students who inhabit the buildings and walk along the streets: Mather, Brattle, Holyoke. Their histories—as slaveholders—have largely been overlooked since the buildings were erected and streets paved, until recently. At both Harvard College and Harvard Law School, students, faculty, and administrators have begun reconsidering titles and symbols because of their associations with the legacy of slavery. At the College, the House Masters agreed unanimously last month to change their title, citing concerns about the racial implications of the term “Master.” Meanwhile, a group of students at Harvard Law School are calling for the removal of the school’s seal, which they criticize for its ties to the formerly slaveholding Royall family that endowed Harvard’s first law professorship in the 19th century. 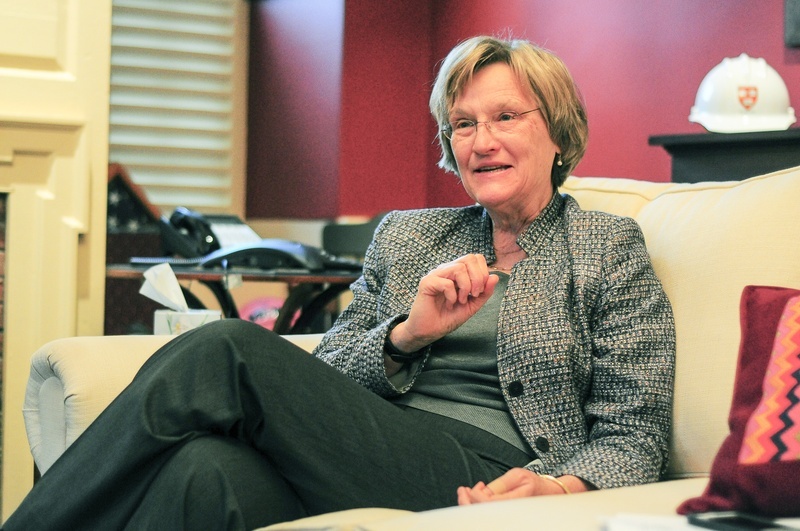 University President Drew G. Faust, pictured here during an interview in December 2014. In the the midst of discussions across Harvard about historical legacies and race, University President Drew G. Faust said that Harvard should not begin renaming its buildings or titles en masse. For Faust, a Civil War historian, changing names or symbols amounts to falsely negating historical truths and legacies. Instead, Faust said in a December interview, the people and culture behind these names and titles should be historically understood and contextualized. 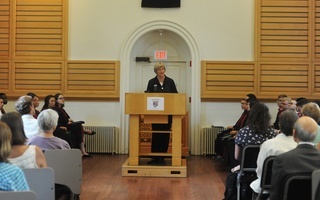 Although she publicly supported the title change of the College’s House masters, Faust said she is undecided when it comes to changing the Law School’s seal, and cautioned against other name changes. “I feel quite strongly that we should not be trying to erase our history of names,” Faust said. “I think we’re all going to be facing these questions, and the case that I would make is...about the importance of sustaining our history, not erasing it,” she later added. As Harvard’s student body has become increasingly diverse, names and titles gracing buildings and positions for centuries have come under siege for their associations with a darker side of the University’s past. At the College, students and House Masters said that recent conversations about race around the country had intensified existing concerns about the title, which they said suggests ownership over another person. 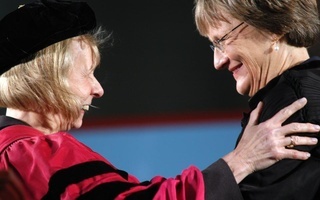 Citing decades-old conversations about the gender implications of the term “Master” and the more recent national discourse about race on college campuses as reasons for change, Faust said she supported the decision to change the “House Master” title. House Masters are expected to announce a new title early this year. Still, Faust said she would oppose changing other symbols or names at Harvard—like Mather House—because of their potentially troubling historical origins. Increase Mather, the namesake of Mather House and an early Harvard president, owned slaves. Faust taught American history at the University of Pennsylvania for more than two decades and has published a series of award-winning books about the antebellum-era American South and the Civil War. In December, Faust published an article titled “John Hope Franklin: Race & the Meaning of America” in the New York Review of Books, in which she wrote about the importance of complete historical understanding. In the article, Faust explores Franklin’s legacy for unflinching historical scholarship about racial inequality in America and the importance of history to modern discussions about race. Still, Faust has yet to make up her mind about the changing of the Law School’s seal, saying she wants to learn more about the specifics of the case. At the end of November, Law School Dean Martha L. Minow appointed a committee of Law professors to study the seal and reconsider its use; that committee will submit a report to the Harvard Corporation, the University's highest governing body, which will make the final decision, in March. Members of the advocate group demanding that Harvard Law change its seal, “Royall Must Fall,” though, disagree with Faust’s line of thinking. Law student Alexander J. Clayborne, a member of the Royall Must Fall and Reclaim Harvard Law School student activist groups, said that buildings and titles at Harvard should be reevaluated on a case by case basis. Some of the people whose names have more recently christened Harvard’s programs, professorships, and buildings share Faust’s opposition to the erasure of Harvard’s more controversial figures. Peter L. Malkin ’55, a New York real estate magnate and namesake of the Malkin Athletic Center, argued that Harvard’s previous leaders and benefactors should not be judged by modern moral standards. “I think that there have been many changes in society since some of the names were designated, and that certain ways of doing things a few hundred years ago...are not acceptable now, but would not have been thought to be unacceptable at the time,” he said. Paul J. Zofnass ’69, another prominent contributor to the University, agreed with Malkin and questioned the legality of revoking contracts by removing donors’ names from their buildings. “I think questioning and challenging it is a healthy dynamic that takes place, but I don’t think you ultimately can come to the conclusion that you can break a contract or change a symbol,” Zofnass said. 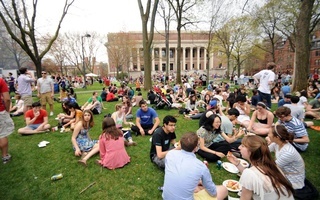 Both Zofnass and Morgan Chu, a Law School alumnus and the former president of the Board of Overseers, Harvard’s second highest governing body, said they supported the role of student activism in making these questions a part of campus discourse. The deanship of Harvard Law School is named for Chu, and for him, institutions should be open to change after a thorough examination of the facts. “Institutions should change. Institutions should respond appropriately to suggestions and proposals for change,” Chu said, adding that he does not have a set point of view on the question of the Law School’s seal. Faust said student input and the recent conversations about race on campus demand nuanced evaluation and consideration. “I think it’s a tension that we’re going to just have to keep working on,” she added.